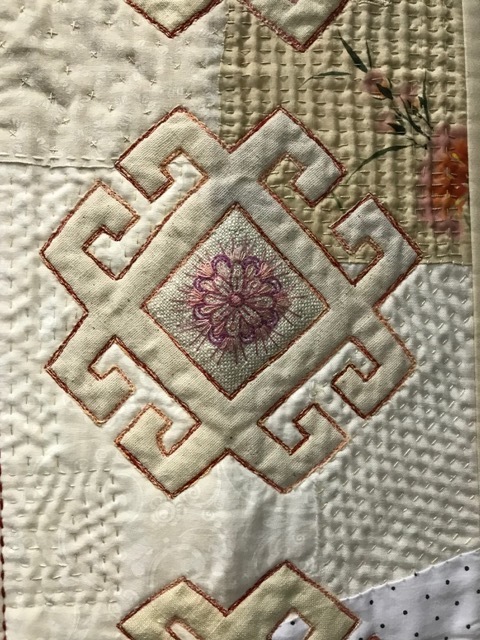 Had a lovely day at the Queensland Quilt show. There were three major exhibitions: SAQA My Corner of the world The AQC Made in Australia Challenge and the Queensland Quilters Quiltshow. This exhibition displayed amazing work. The techniques I noticed especially was the amount of digital transfer of imagery to fabric and the high level of micro quilting. I found this work by Kate Madeloso utterly charming. While this is only a detail of the whole work, t has such lovely ambience. I love the movement in the women's skirts and their mostly middle aged figures. The muted tones with the red highlights contrasting with the green foliage is so well selected. I also love the details in the rest of the quilt. See the little stars? Guess what is in the middle of each. This lovely piece by Jenny K Lyon is so beautifully stitched and the grass heads so beautifully observed. I love the dynamic feeling of the wind blowing through the grass, and the simplicity of the colour. I like the simplicity of the hills, notice how the lines vary in width to form the curves. It's rather lovely. I keep coming back to the lake views by Joan Reive. I think its the colour and the way the water has been handled. You can really see the light glinting on the water. There are so many more beautiful and original quilts. Its really worth going to the SAQA website to check them out.